I really did mean to add a regular WWWW post yesterday evening to go live at 6 am this morning as is my norm. However, I was reading this pretty good book and got distracted. So my post is a little late, but it comes with awesome news! I’m going to be interviewed on the radio tonight. Growing up in Houston in the 80s and 90s meant there were a lot of different radio stations over the years for me to find rock n’roll music. 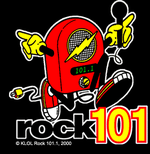 But the one that stands out among all the others is 101.1 KLOL. Most people who lived in Houston from 1970 to 2004 and listened to the station will be familiar with the name Outlaw Dave. He will be interviewing me tonight at 9:15pm CST. I met him once in an elevator at the Clear Channel office. I was too tongue tied to say much but I did smile. Hopefully I’ll be able to talk tonight. Next Next post: Anniversary Event and Give Away!